Our task in conjunction with the Merchant Navies of the United Nations, and supported by the Allied Air Forces, is to carry the Allied Expeditionary Force to the Continent, to establish it there in a secure bridgehead and to build it up and maintain it at a rate which will outmatch that of the enemy. Let no one underestimate the magnitude of this task. The fulfilment of this task required a wide range of operations, which closely align with the Royal Navy's current capabilities and vision of the future. Landing Craft & Escorts off Arromanches, 6 Jun The maritime operations required to permit D-Day had begun several years before. Success in the Battle of the Atlantic, the joint (multi-service) and combined (multi-nation) campaign, which endured for the entire war and was led by the Royal Navy, was essential if Britain was to survive as a base for the assault on Europe. It was also vital if American and Canadian military power was to be successfully imported for the invasion. Simultaneously, the maritime blockade of German controlled Europe put serious limits on Nazi war production. Having secured global communications it was then important to dominate the waters of the English Channel. 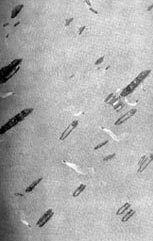 Joint naval and maritime air offensives in the spring of 1944 forced German shipping back into its harbours. This dominance allowed the build-up of Allied forces along the south coast of Britain, relatively free of naval attack or reconnaissance. It also facilitated deception policies that would do so much to assist the Allies in Normandy. The naval combat vessels were approximately 79% British & Canadian; 16½% American & 4½% other Allies.